Its the beginning of a new Month today and it is with great pleasure that I introduce to you all our February Artist of the Month Debi Watson. 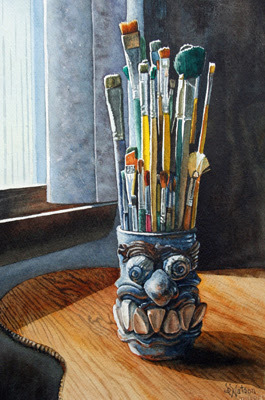 Debi is the President and a signature member of the Pennsylvania Watercolor Society. 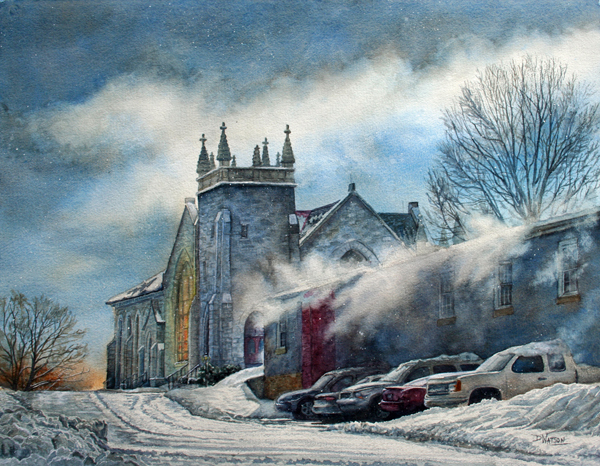 Last year she also was elected as a signature member of the National Watercolor Society. She paints in both watercolour and oils in a traditonal realistic style. Debi has kindly written a message to you all below. She is willing to answer any of your questions this month. I hope you will again take this fabulous opportunity to learn from such an amazing artist. If you would like to ask Debi a question please click on the word comment at the bottom of the post. a new window will then open up with a white box for you to type your questions or observations into. I was born a love for art and spent a lot of my childhood drawing, much to the chagrin of my parents, who tried to encourage 'more practical' uses of my time. I continued art as a hobby and started painting watercolors in 1983, with a how to paint craft store book as a guide. My work was lauded by judges from the beginning, which was kind of unnerving for me. At one of the first shows I entered, my painting won two awards and I was asked to exhibit in the professional catagory. I was so intimidated that I didn't show for years! Being self-taught, learning took a lot of time, but gave my work it's own unique look. In 1999, I retired from nursing to paint full time. 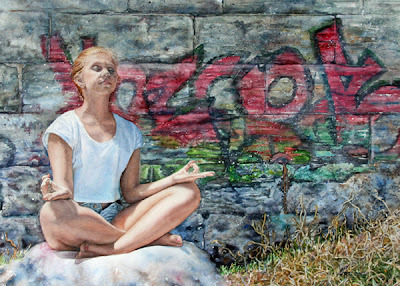 I have enjoyed entering the juried shows as a way to push myself toward excellence. My work has been accepted and won awards across the nation, being featured in over a dozen magazines and books. I'm looking forward to being your Artist of the Month and answering any questions you might have. Wow! That painting of the church in the snow is gorgeous! I love the snow blowing off the roof! How did you create that movement in the snow falling? And the added little bit of oranges/yellows in the window and sky on the far left hand side balances it perfectly! I hope you can pull it up to see it. I had photographed this spot in the fall and when I went back in the winter, the blowing snow seemed like a gift just for me to paint. Awesome video! Love how your scene sparkles in the end! Your work is amazing. Do you always work with a limited range of colours? What are your three most commonly used colours for you landscapes? My three most commonly used colors would be cobalt blue, quinacridone red and aureolin yellow. I usually mix my own black with thalo blue and raw umber violet. As long as I stick to the transparent colors, I always get an interesting hues. The only opaque colors I use regularly are cerulean blue and cobalt turquoise light. So I have a light brown(burnt sienna) and a dark brown(raw umber violet), a light red(quin red) and a dark red(alizarin crimson), a light blue(cobalt) and two dark blues (ultramarine and thalo - more transparent but it turns green instead of gray), a light yellow(aureolin) and a dark yellow(quin gold), and on black/green - perylene. Thank you for sharing the colours you use Debi. I wish I could find a transparent equivalent for cerulean. Its one of the few opaques too that I sometimes use. I like the Cheap Joes' Level Lifter - I use the 1/2 inch for a lot of stuff. You could just cut off an old acrylic or oil brush close to the metal, but the lifter wasn't expensive and will probably last your lifetime. And I kind of like the opaqueness of cerulean. I put it on top of black for a glossy highlight, or spatter it into my trees while wet. I don't know if it looks like the sky showing through or what it suggests, but spattering cerulean and burnt sienna in wet tree washes just looks right. I will have to look for one of those too. I know you mostly use 300lb paper which is pretty hard wearing but do you find it damages the fibres at all? I mostly use a magic eraser and this is great for lifting back to white but if you want to glaze on top you do have to be very very gentle or the paint takes differently to the surrounding areas in subsequent layers. Yes, i like using cerulean for a final glaze. Its great to help create a smoky atmosphere. I just want to find a similar colour thats transparent to glaze with and I'm not, as yet having much success. Hi Debi, Do you work mostly from Photographs when you paint landscapes or from real life? I paint almost exclusively from photographs, but I often make notes when I'm taking photos, so I can refer back to what I liked about it in the first place. I often print out a color photo and several black and whites of different contrast so I can see exactly how the subtle color and value changes go - that's what makes it look real. When all else fails, I go back to the physical form - like for Serenity, I just couldn't get the nose right and my niece had already gone home, so I was struggling. Then I noticed my daughter has the same nose (genes) and got her to sit for me. Mostly, I see reality better from photos. Hey Deb. I think your work is amazing, I love your landscapes and portraits. Tell me, what is your favourite portrait palette, and do you have any tips for a successful portrait, especially in getting a likeness? For pink skinned people I use permanent rose, a light yellow like aureolin, and cobalt or cerulean blue. For more orangy skin colors, I like holbeins cad red light, raw sienna and cobalt or cerulean blue. Often, when finished with a portrait I'll put a very dilute wash of alizarin crimson over it that just seems to bring it to life. I often trace the main elements, but catching a likeness often means having the shadows just right to suggest the underlying bone structure. To see the shadows clearly, I put my photo in different (black and white) contrast levels, making everything very light to see where the total highlights are, or very dark, so I can see how the shadows lay, then paint from a photo with the truest colors. Hi Debi, What is your favorite subject matter? What a timely question! Right now I'm changing my focus from painting for the shows to painting to sell, and my subject matter choice is shifting a bit. I spend a lot of time deciding what to paint. Right now I'm making a list of ideas, making color studies and sketches. Once I commit to a painting, I'll continue to work on it until it's finished, but I'll have classes to teach in the meantime, so I will be working on other things. I do work on more than one at a time, but I have to force myself to stay focused or nothing would ever be finished. Having a deadline, like painting for an exhibit, really helps me to finish work. I love your work. You said you had just shifted emphasis. How do you know what sells and how does this change your painting style to when you paint for exhibitions? Good question! Anything that touches people's heart with beauty, health, hope or happiness sells. Young animals or people - the promise of life going on. Sunrise - the promise of another day. Artists have notoriously odd taste in what they personally like, but I look at ideas and ask myself, would I want to hang that in my house? And people can only buy art if they have disposable income, so you might want to think about what that economic niche likes. Example -People who can afford horses can afford paintings. It's entirely possible to paint from your heart and for a target market that would be interested in your work at the same time.